Exploded toads, monkey foetuses and disembowelled mice; the ingredients for a great evening! I love getting invited to places like the Royal College of Pathologists, where the walls teem with portraits of sternly bearded Victorians and the building simply reeks of centuries of accumulated knowledge. The occasion was the launch of the One Health, One Art medical art exhibition, showcasing paintings by Geoffrey Harrison (who I've previously written about) and John Gales (who I haven't). 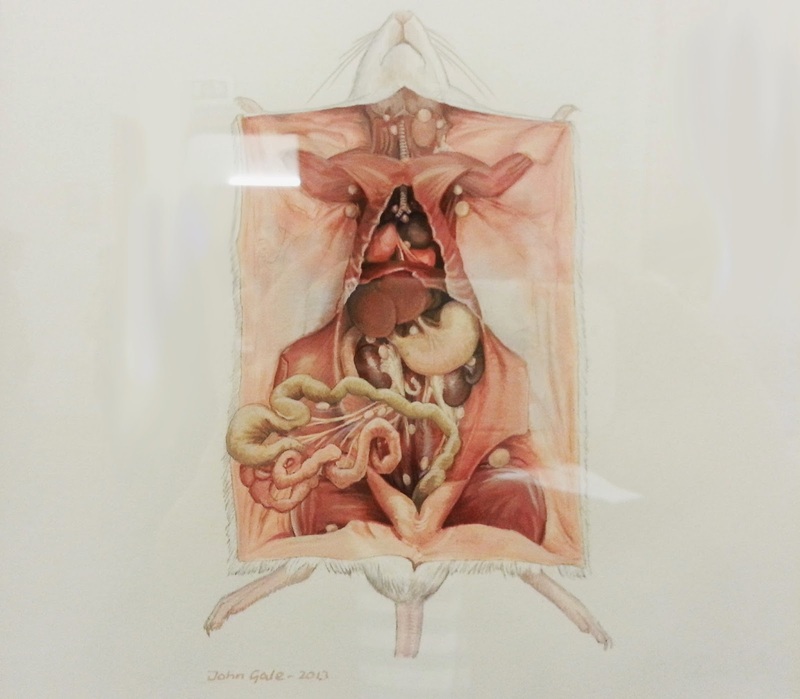 Medical art is one of my favourite art niches. The intersection between objective, analytical science and subjective artistic interpretation gives rise to some fascinating frictions and unpredictable common grounds. This exhibition showcases precision with most of the images approaching photorealism, with a dual function as art and as an educational illustration. One tempting response to these exactingly drafted pictures is to wonder why they don't just use a photograph? One Health, One Art answers this by underlining the importance of artist as conduit, the works subtly layering in beauty, meaning and truth. One of the most eyecatching pieces is Harrison's RVC Monkey Foetus. 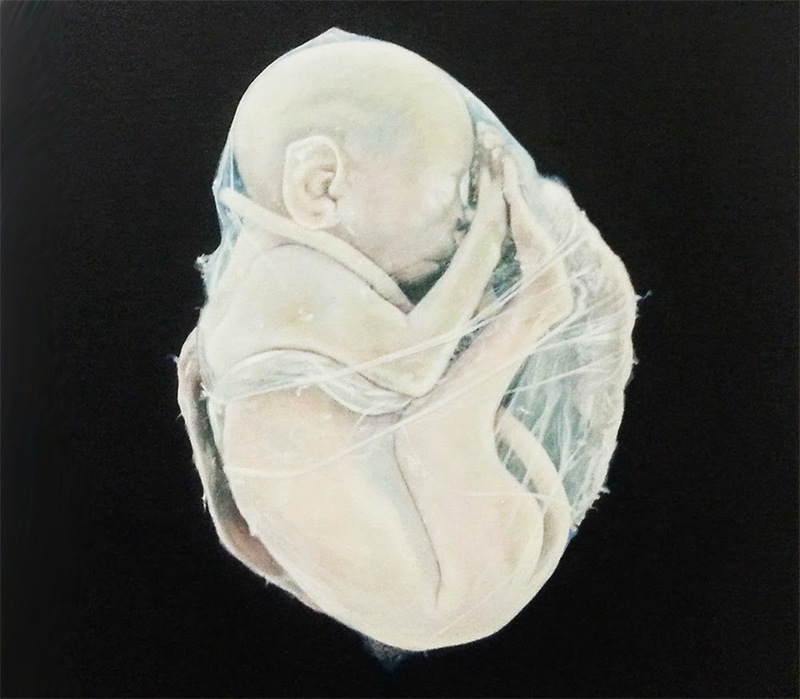 Shrouded in its amniotic sac, the foetus floats like a star in an inky black void. The delicate colouring renders the skin translucent, the patches of light blue and pink suggesting veins and muscles concealed just below the surface. At first glance you assume this is a human foetus, but as you spot the tail and prehensile toes your perception gradually changes. This internal shift underlines the false distinction between 'man' and 'animal', forcing the viewer to re-evaluate their ingrained response. If you'd have happened across this foetus floating in preservative in a pot you'd have gotten a taste of this process, but the tenderness and care that's gone into this rendering adds an element of love. The artist cares about his subject, and that care radiates out to us, the effect being an emotional involvement that you just wouldn't get from a photograph. A similar effect takes place in John Gale's Anatomical land mark descriptors of the Mouse. Here the subject has a serenity that borders on surreal given that its diseased guts are hanging out of its chest. The relaxed expression allows us to anthropomorphise the mouse as teacher. I imagine it casually taking us through an inventory of its lesions and outlining their function for our education, willingly sacrificing itself for science. Crucial to this air of calmness is the lack of blood. I imagine opening up a mouse for dissection is a fiddly, messy, frustrating affair, so in this illustration we see reality sans chaos, a world of crystal clear draftsmanship and delicate pastel shades, all of which adds up to a weird beauty that you might not expect to find inside a dead rodent. 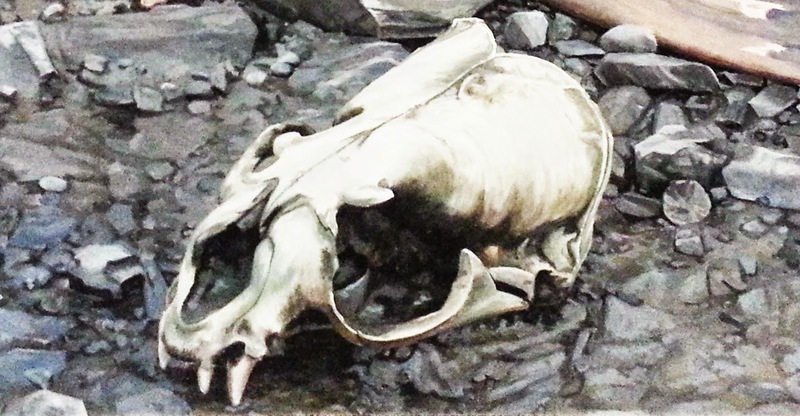 Nearby is Top of the Stream, a painting that showcases a different brand of death. 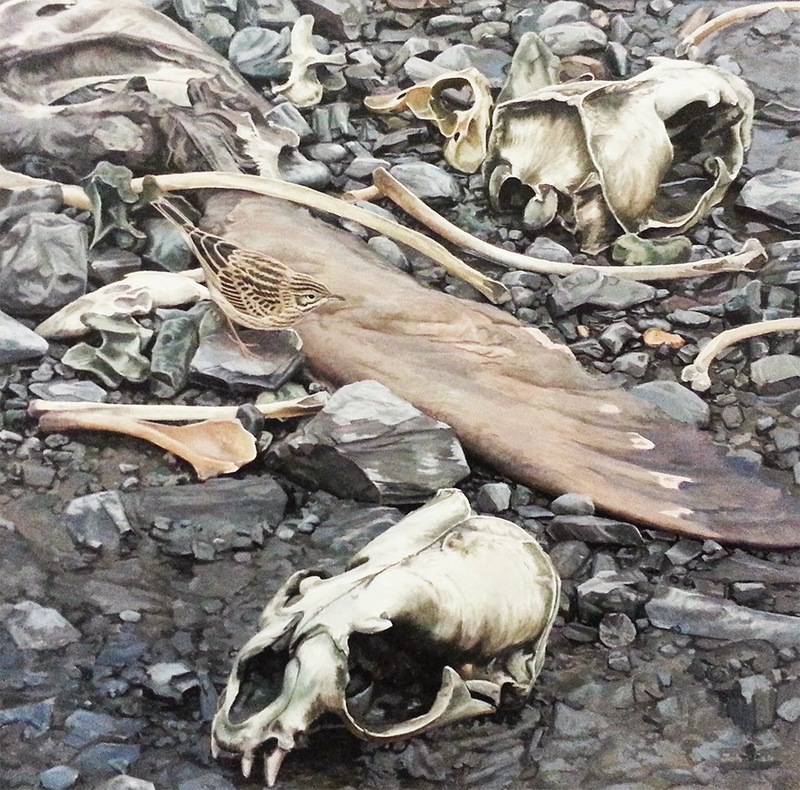 Gale's biography explains that he's travelled around the world painting wildlife, this particular painting showing an open air seal grave in South Georgia. In his words: "after the breeding season, exhausted dying males seek the peace of 'no mans land', close to rivers and streams, to die." In comparison to the other images which isolate their subjects, here we see nature in situ; bones and flesh decomposing amidst the bare rocks. I love the continuity of colour between these elements, the brown of the seal's flipper gradually blending into the grey rocks, the impact a quiet and respectful outlining of the link between organism and environment. Soon we begin to examine this scene with a forensic eye, sorting bone from rock like we're reconstructing a crime scene. This is a pretty grim landscape, but it's saved from being too morose by presence of a jaunty looking Pipet, a gentle nudge to the ribs that life carries on, even in a graveyard. My final favourite is Harrison's RVC Anatomy Dogs. On seeing this my first reaction was to joke that I hoped those dogs were sleeping. In my defence in a room covered in pictures of dead things it's natural to assume the worst when you see an animal lying on the ground not doing much. So I was pleased to learn that these dogs are officially, one hundred percent, definitely alive (or at least they were when this were painted). Meet Viper and Bonnie, gainfully employed as 'anatomy dogs' by the Royal Veterinary College. Living in kennels attached to the school, their job to trot out to lectures and act as living models for students. Most greyhounds don't meet pleasant ends; when they can't race their employment and their lives tend to terminate simultaneously. 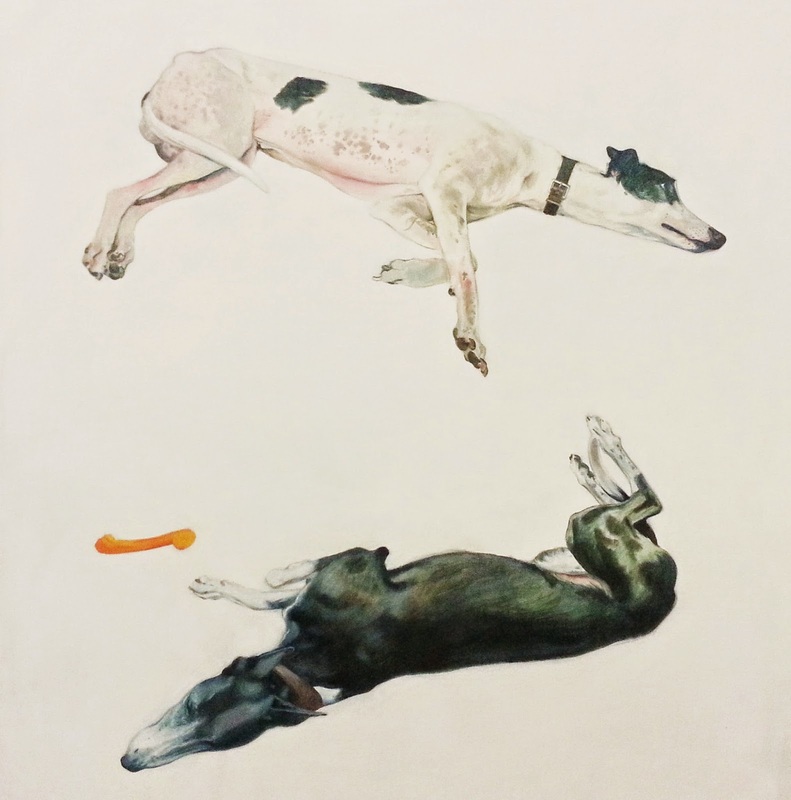 Fortunately the fat-free anatomy of a greyhound and their innate docile nature make them perfect teaching aids, and based on this painting, they look like happy dogs. This painting is a ray of sunlight that pierces the morbid atmosphere of the room. It's pleasant, but as you can probably tell by now, I don't mind a bit of morbidity; as far as I'm concerned the processes of death, deformity and decomposition have as much potential for beauty as any glowing sunset or tasty bowl of fruit. What these artists do is go beyond simple representation to achieve a Herzoggian 'ecstatic truth', elevating their subjects with their imaginations, their gentle stylisations and their imagination. If you're out and about in the West End pop down to the Royal College of Pathologists and check it out. If you like this stuff there's much much more to see. I didn't even explain the squashed toads! Open weekdays by appointment until 30th October 2014. Royal College of Pathologists, 2 Carlton House Terrace, London, SW1Y 5AF.